Martha Stewart Wedding has features such as beautiful wedding dresses and where to purchase them these dresses are amazing from simple and plain, exquisite and elegant to fairy-tale, beautiful dresses at every hemline from trailing trains to short and chic minis, from taffeta, silk, satin or lace the choice is yours. 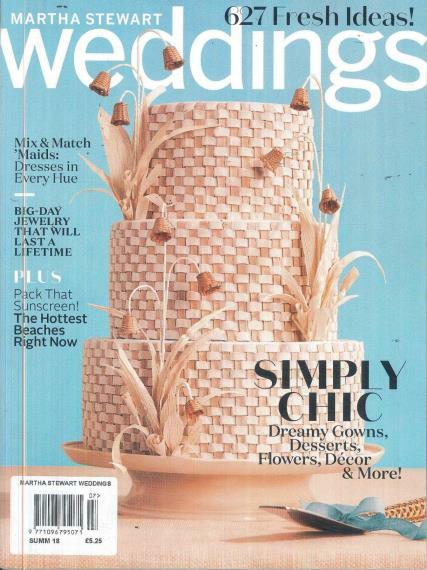 Buy a single copy or subscription to Martha Stewart Weddings magazine. The Power of Flowers how to get the look you desire stunning arrangements for any colour palette. Flowers can speak the style of your wedding from softly or broadcast it brilliantly. Choose Light and Airy this looks classic, contemporary or a little bit of both. Bright and Sunny from mellow yellow to punchy peaches, these cheery colours are reason enough to celebrate. Or Rich and Vibrant these notice-me coloured flowers are for brides who dream in colour; against a neutral backdrop the fiery hues pack an unforgettable punch. The Wedding Invitations are the first clue your guests will receive on the colour theme and type of wedding you are planning. Your invitations give a sneak insight into what your guests will expect whether it be a traditional, contemporary or fun wedding. Invitations are a clue to what colour your bridesmaids are wearing or what colour your flowers maybe. Once you have decided your theme your invitations should reflect that. Wedding Cake- A slice of Style. Your wedding should feel like you right down to the last DELICIOUS detail-the CAKE! So whether you look toward tradition or fancy something unconventional, Real Weddings have a choice of confection to match. Choose Completely Classic, Utterly Romantic Thoroughly Modern, Charmingly Rustic or Wildly Unique. Bridal Beauty- Every bride wants to look her best walking down the aisle and during all the fun hours that follow. Recently wed women shared their makeup, skin and hair products that really performed, from ceremony to sweet send off. Tips on choosing the perfect makeup for that perfect complexion, gloss that stays put, how to make your eyes sparkle and how to get that brilliant smile.